This has been an important year for “GMT” watches, which is an acronym for Greenwich Mean Time, based on the mean solar time at the Royal Observatory in Greenwich, London that sits on the prime meridian (used for calculating longitude) and is widely used as a reference time for all the different time zones around the world. In 1955 Rolex launched the first GMT watch (Ref. 6542), designed specifically for intercontinental commercial pilots at the now defunct airline Pan Am. The watch, with the ability to display two time zones simultaneously, one via a traditional 12-hour hand and the other via a 24-hour hand, went on to become a legendary professional timepiece, and now many decades later, is the benchmark by which all other GMT watches are measured. Basically, with the current model, you set the red GMT 24-hour hand to your home time (reference time), which is also linked to the minutes, and then you can separately set the standard 12-hour hand (local time), without it affecting the reference time. The local time is linked to the date. So if you like you can leave both hour hands set to your home time, and when you land at your destination, you can quickly set the standard 12-hour hand to the local time, in one-hour jumps (because it is quickset), without affecting the accuracy minutes and seconds of the reference time. Following the launch of the white gold GMT-Master II with a blue and red ceramic “Pepsi” bezel in 2014, Rolex finally came out with a much anticipated stainless steel (904L Oystersteel) version this year. 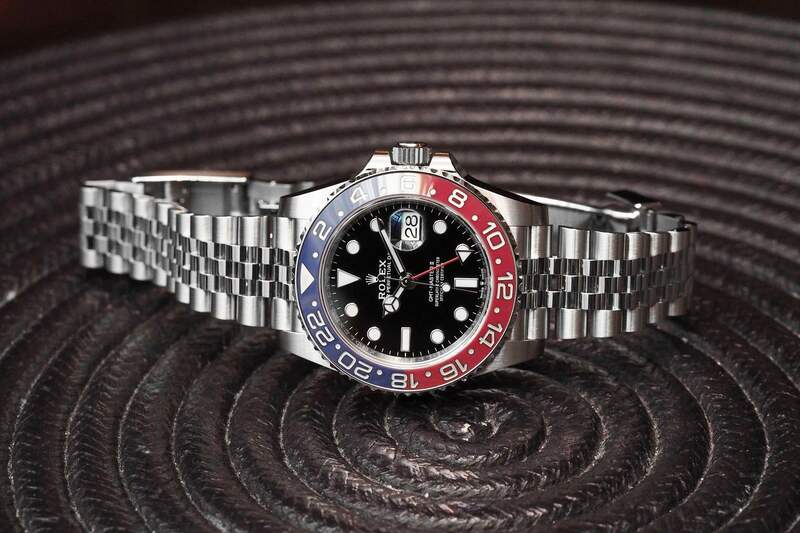 The Rolex GMT Master II “Pepsi” (Ref. 126710 BLRO) is the watch that serious Rolex collectors and enthusiasts alike want right now. 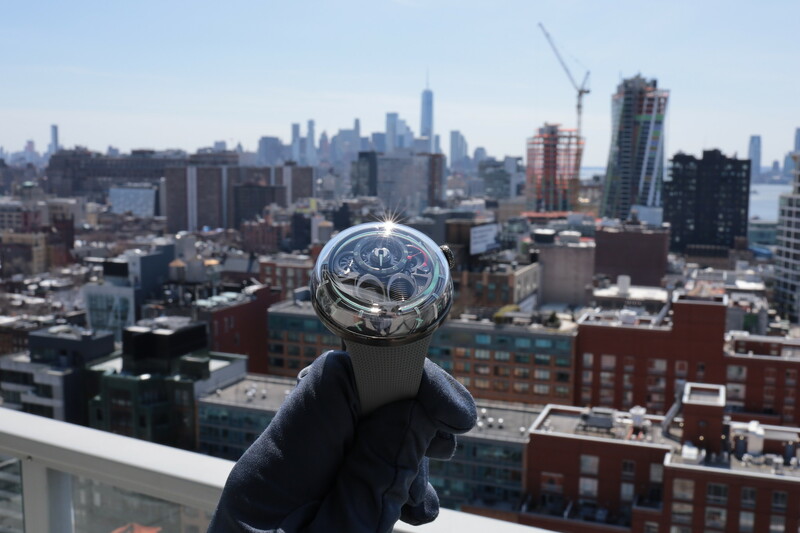 It’s currently available at authorized Rolex dealers, although there’s already a huge waiting list, and so naturally the demand has caused the price some wealthy buyers are willing to pay to reportedly double. Whether the demand is so high, or the supply is just restrained, is a good question that’s hard to answer. Nevertheless, this is hottest GMT watch of the year. Although Rolex’s more affordable brand, Tudor, might have something to say about that, considering they too launched a new GMT watch with a Pepsi bezel and an in-house movement this year, for less than half the price. The Rolex modus operandi is that they never use the same dial for both the steel and gold version, so they’ve – somewhat quietly – changed the white gold GMT-Master II dial to blue to differentiate the two. Plus, the white gold is only available with the Oyster bracelet and the Jubilee bracelet is now exclusive to the steel model. And no, you cannot opt for an Oyster bracelet on the steel GMT-Master II anymore. There is one more detail that the white gold Ref. 116719 BLRO GMT-Master II does not share in common with the new steel GMT (Ref. 126710 BLRO), and it’s a big one: the white gold version still uses the now last generation caliber 3186 whereas the steel model (and the two new Everose versions) use the all-new caliber 3285. In the past, the transition to newer movements within the collections, sometimes creates what so-called “transitional” models such as the Ref. 16710 that’s powered by the caliber 3186 versus earlier production versions of the same Ref. 16710 that are powered by the 3185. Both are highly collectible, but the version powered by the newer 3186 caliber, which is far rarer since less 16710 references were made with the 3186 (although nobody knows how many). Incredibly, this has, in a period of just 10 years, caused the value of the transitional model to outpace the earlier version quite a bit. The versions with a 3185 inside go for approximately $8-10k, which is excellent, but the 3186 powered 16710s go for approximately $25-30K (at the time this article was written), which is spectacular – despite the two watches looking the same (apart from imperceptible difference such as slightly different dial fonts and a laser engraved crown on the glass of the newer version). With the new GMT-Master II 126710 Rolex has subtly redesigned the 40 mm diameter case (by rounding off some the sharp edges of the case lugs) so as to create better ergonomics, and while I didn’t compare the new and old designs side-by-side, it does seem to be more comfortable on the wrist. That’s also due in part to the lighter weight and unique fit of the Jubilee bracelet. Together, those two design elements give the watch a slightly smaller, almost vintage feel. As for the new movement, caliber 3285, it of course still features a robust Rolex design, including a traversing balance bridge, but now with a more premium finish, which is much needed in my opinion for a watch nearing the $10K price point. Furthermore, the power reserve has been increased by 46% (from 48 to 70-hours), something more and more brands are doing and that is an important improvement that’s difficult to argue with whether we’re talking cars, phones, or watches, all the same. Rolex got to this by increasing the size of the barrel, as well as improving the regulation system such as with the implementation of the Chronergy escapement. This movement, is the subject of 10 patents, by the way. The crown locks to the case and includes the Rolex Triplock system for water-resistance to 100 meters. The Cerachrom (ceramic) two-tone bezel features engraved PVD platinum filled numerals and graduations and a very crisp 24-click bi-directional rotation. Automatic winding powers the mainspring power barrel as it oscillates in either direction. Rolex’s trademarked Chromalight long-lasting blue luminescent material is used for the hands and applied hours markers. The five-piece Jubilee bracelet, like existing Oyster bracelets, features the folding Oysterlock safety clasp system with a 5 mm comfort extension link. 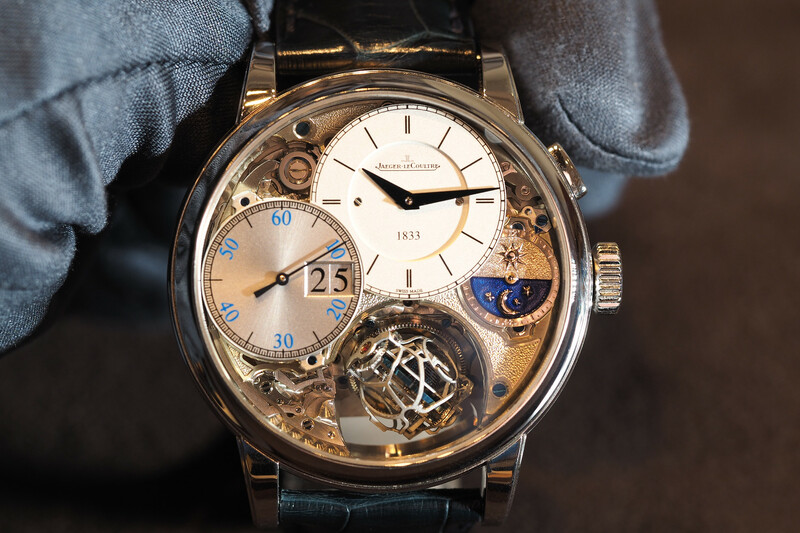 All movements have been tested fully cased up (as opposed to being tested prior to casing like standard COSC-certified chronometers) and are adjusted to a rate of -2/+2 secs/day – which is about as good as it gets for a mechanical watch – hence the use of “Superlative” in addition to Chronometer.